Cheapest Gas in the World...? Late one afternoon in 1915 – three years after arriving in Akron-as he walked home from work, Aiden noticed a small crowd of people gathered on the opposite side of the street. They were clustered around an older man who seemed to be talking to them. Not being able to hear what the man was saying, Aiden crossed the street to satisfy his curiosity. At first, the man’s speech did not make any sense to Aiden. He spoke with a strong German accent, and Aiden had to listen carefully to catch what the man was saying. Finally, it dawned on Aiden. The man was preaching! Preaching, right out on the street corner! ‘Doesn’t this man have a church to preach in?’ Aiden thought to himself. ‘And it isn’t even Sunday! Why is he so excited?’ But as Aiden listened, the words of the elderly street preacher began to find their mark in his young heart. Those words burned in Aiden’s heart. He could not get the voice of the preacher out of his mind. As he slowly walked home, he thought over what the man had said. Never before had he heard words like those. They troubled him. They awakened within him a gnawing hunger for God. When Aiden arrived home, he went straight to the attic, where he could be alone to think this out for himself and to wrestle with God. No one knows all that transpired in the Tozer attic that afternoon in 1915. 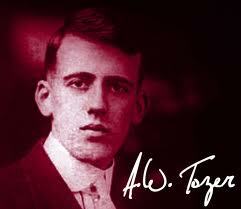 But Aiden Wilson Tozer emerged a new creation in Christ Jesus. His pursuit of God had begun. Aiden’s conversion to Christ was a transforming experience in every way. Inclined to be cynical, he thought nothing of turning to agnostics or even to atheists for counsel. Suddenly, his entire life as radically and wonderfully redirected. A whole new world had opened up to this youth with unbounded intellectual curiosity. It was a world that would take him a lifetime and more to explore fully. In later years he would say of himself that as a young man he was so ignorant it was a wonder the top of his head did not cave in from sheer emptiness. From the moment of his conversion, however, Aiden had an insatiable thirst for knowledge and a ravenous hunger for God. The Tozer household was crowded with eight family members plus boarders. Aiden had to find the time and place to get alone with God, time for prayer and Bible reading and study. In the basement there was a small unused space behind the furnace. Aiden claimed it, cleaned it and made it comfortable. It was a refuge where he could get away from everything and everyone and literally spend hours in prayer, study and meditation. Long years later Essie remembered how at first, when she would go down the cellar stairs for canned goods, she could hear frightful groaning coming from behind the furnace. Soon she came to recognize the sound as that of her younger brother wrestling with God in prayer. For Aiden, it became a lifetime habit. Nothing would take the place of knowing God firsthand.